As our business grows, our needs to analyse and understand it grow even faster. This means we must get better at generating reports so that more people can use them with less effort. One tool for improving long reports is to break them up in sections. In Excel spreadsheets, this can be done with the outline feature. This post looks at how we made the axlsx gem show outlines the way we wanted. # outline level 1 and do not hide them. Please ignore the xls helper function for the moment, but note that it uses the Axlsx gem which is a great tool. 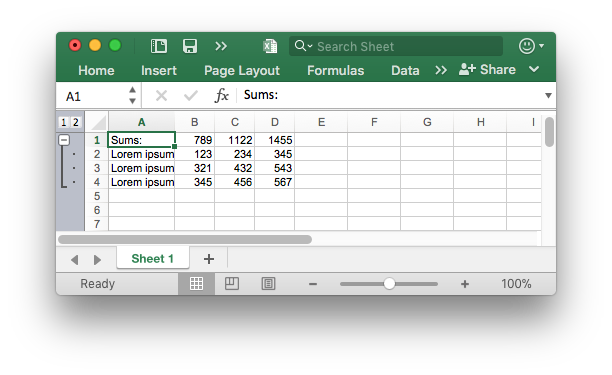 (If you think that is obvious, consider that if you create this sheet manually in Excel, the button will end up next to the sums automatically). So how do we make it go to the top? The documentation (and the vast collection of examples) have nothing to say on the subject, but they don’t go into a lot of detail about anything, so it doesn’t surprise me. On the other hand, past experience shows that the gem is better than the documentation, so I’m confident that we can find a way to do it. But how? Clear all outlines (Data > Group and Outline > Clear Outline). Save the file as “plus_above.xlsx”. The first chunk is a timestamp, so we can ignore that. The second has what we need: the good file has a sheetPr section with a outlinePr element with a summaryBelow attribute—that has to be it! We run it, and it works! If you find the use of xmllint overkill or just don’t have it installed, I recommend perl -i -pe 's/</\n</g;' $(find above below -name "*.xml") instead.